This small royal palace has an amazingly brief history as such things go. The first parts of the castle were built in the latter part of the 1800’s by Sweden’s Crowned Prince Oscar (II) for his wife and eldest son who both were sickly and needed fresh air. 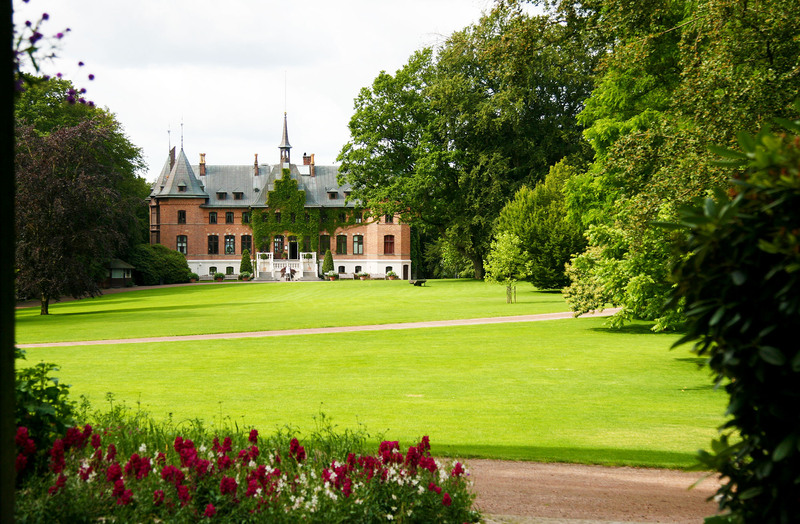 When Oscar became king in 1872 following the death of his brother, they continued to reside at Sofiero in the summer, but being Sweden’s Royal couple with four princes as well as the royal court that flocked with them, the summer villa had to be expanded. It gained another floor and a total of 35 rooms excluding ‘finance areas’. In the years that followed, Sofiero saw much of the Skåne nobility through its halls as well as foreign royalty. Tsar Alexander visited in 1893. In 1901, King Edward VII of England visited the castle. But over the course of the 1890’s the royal couple visited the estate less and less. It had been decided that dry forest air was better for the Queen’s fragile health rather than the humid, salty breezes off the strait between Denmark and Sweden. The last time they were together at Sofiero was during the Helsingborg exhibition in 1903. When Oscar and Sofia’s grandson, Prince Gustaf Adolf married Margaret of Connaught in 1905, they were given Sofiero as a wedding gift from the king and queen. Margaret cleared out the castle of it’s heavy dark furnishings in favor of a more modern, bright style. The gardens were also sorely neglected. Coming from a family of gardening enthusiasts, Margaret was inspired by the English garden ideals and designed Sofiero’s new gardens. It wasn’t until the 1930’s when the gardens began to gain their current claim to fame. After the death of Margaret in 1920, Gustav Adolf remarried. Shortly there after, he began collecting rhododendrons and soon there were more than 500 different varieties. The fruit trees planted originally in the garden yielded 26 tons of fruit annually. Most of the harvest was sold.